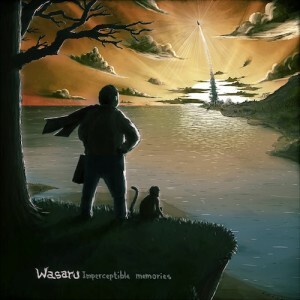 Imperceptible Memories is the fourth album from Wasaru – an artist and musician that does not need any “hocus pocus” to flower something up. His focus is plain, real, down-to-Earth, exceptional, and meaningful music with vocals that are heartfelt, passionate, realistic, deep, hypnotic, and gracefully charismatic. This release is filled with drama, excitement, and real life feelings of hopes and dreams that come through as the singers and lyrics take hold and paint a tapestry of images within your heart and soul – articulately expressed and performed just for you, to cherish and use to gather wisdom. Life is a poem that grows and develops as each and every word forms and resonates inside you and around you, as does this release. Mastering and artwork by Wasaru. MP3 Download | FLAC Download | WAV Download · Download count: 6,638. A beautiful trip in 12 stages of dreams and surprises. Super! oh.. yes, i remember… after rainbow static i know why! THAT’S BECAUSE IT IS PROPER MUSIC!!! cool stuff. Definitely different from what we are used to on this site, but certainly nice and refreshing. loving track 3.
was it designed to torture anders breivik in his cell? and yeah, there’s no “hocus pocus” in it that can save it. “hypnotic, and gracefully charismatic”? what a crock of… p.s. label me “hater” for that, please. it will make this opus sound much better for sure. Haters aside, I love this release. Reminds me of Moby, or Massive Attack, great! I… Love… Wasaru… Can’t wait to explore their other works. normaly i cant listen to a album two times in a row.. but this time i simlpy had to listen it again. Delicious way to start the day..!! Thanks..!! I love this album. At first listen it sounded avarage, at second listen I got into it. Really beautiful. Especially loving tracks 3, 8, 9 and 10. Also, I’d like to ask either Wasaru himself or Basilisk, please, whether I could get the rest of Wasaru’s works in flac too? I visited the linked website (www.wasaru.com), and I’ve seen all his albums are CC licensed, but only downloadable in MP3 (including Imperceptible Memories too). So, any chance for flac? Very bautiful album. I really like it, especially Recall. Thanks! Whoever down rates this AWESOME album is completely justin bieber!!! KUDOS for album GUYS! Fantastic ! Respect ! Very lovely album… Groovy, kind of a “lounge” music sound to it. Great, deep vocals as well… feel like there is a lot of meaning behind this project. Music is great but in some tracks – at least in the flac ones – tags turned out being a little fucked up, like missing track numbers in 8 and 9, 1 and 2 having “Wasuru” artist instead of “Wasaru” etc. Si vous aimez Wasaru, cherchez sur jamendo.com . C’est un site légal gratuit, et il a plusieurs albums disponibles. I don’t speak english, but I try. If you like Wasaru, Such it in jamendo.com. It’s legal and free. Many albums. Salut =) Et qu’un chose à dire : Boom boom boom boom ! Thanks for another magnificent post. The place else could anyone get that type of information in such an ideal method of writing? I’ve a presentation subsequent week, and I am on the search for such information. Download at Ektoplazm – Free Music Portal and Psytrance Netlabel.